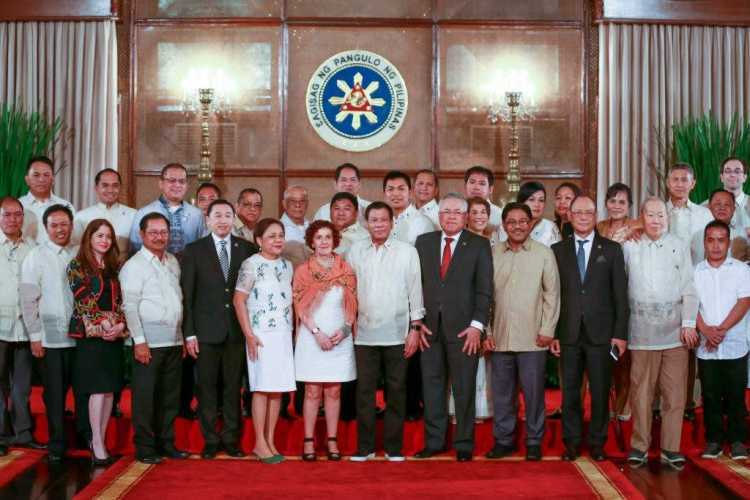 front left) and Mr. Emmanuel Piñol, the Philippine Secretary of Agriculture (4th from front left), Mr. Rodrigo Duterte, President of the Philippines (beside Dr. Hijosa) and the Filipino farmers and manufacturers. The Ananas Anam team led by Dr. Carmen Hijosa just recently concluded a five-day trip to the Philippines this March, to touch base with our current partners and suppliers. The team was there as special guests to attend the 2017 MMK Presidential Awards, which coincided with the launch of a new programme, “The Processing and Postharvest facilities for the Commercial Production of Pineapple Fibres”. The team had a dialogue with Mr. Emmanuel Piñol, the Philippines’ Secretary of Agriculture about the future of pineapple farming and fibre extraction in the country. During the trip, the priority of the team was to strengthen ties with our Philippine partners and to ramp up Piñatex’s supply chain in the country. Dr. Hijosa met with Nonwoven Philippines and Labo Cooperative to work on the quantity and up scaling of the materials to be used in the production of Piñatex™. The farmers and the manufacturing team were very cooperative and proactive in trying to resolve any issues affecting the supply chain. As a result, Ananas Anam has signed an MOU with Labo Cooperative. Our company has agreed to provide funding to Labo Cooperative to facilitate the hiring of additional workers who will gather, decorticate, wash and dry the pineapple leaf fibres. This is a great milestone for us as we strive for fairness and having the official support of the Secretary of Agriculture behind us will strengthen our mission. This will also be in line with our ongoing efforts in helping with the training of Filipino farmers on how to use the new machines since Labo Cooperative is in the process to purchase a new automated decorticating machine to help them be more efficient in producing the pineapple fibers that we use to make Piñatex™. During the trip, Ananas Anam was invited by the Philippines’ Department of Agriculture to the 2017 MMK Presidential Awards, which highlighted the turnover of the processing and post harvest facilities for the commercial production of pineapple leaf fibres. Key people attended the ceremony from different industries including the Philippine Fiber Industry Development Authority (PhilFIDA), which served as a great networking tool for the company to meet new pineapple farming cooperatives. The government is launching a new program that will help the farmers by providing training, decorticating machines, and other machines that can be used for drying and fiber balling. During the ceremony, the government acknowledged Ananas Anam and Piñatex™ as a key proponent for this program. 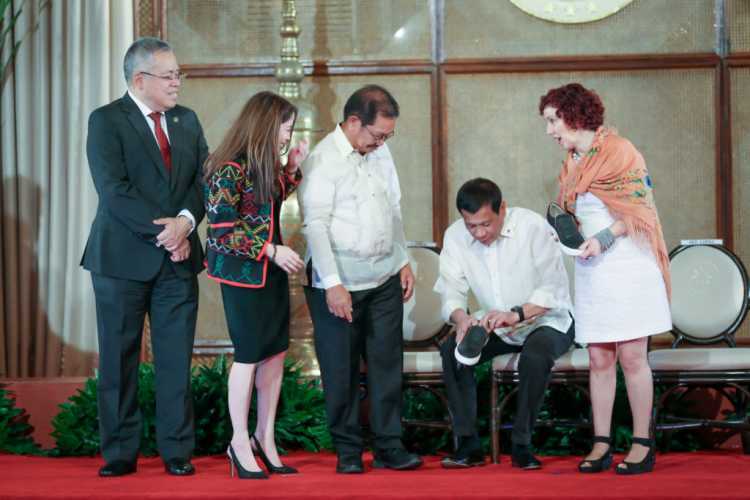 The culmination of the trip was giving a pair of Piñatex™ shoes to Mr. Rodrigo Duterte, the President of the Republic of the Philippines. He enthusiastically tried on the shoes and kept it on for the rest of the day as seen on the photo below with Dr. Hijosa.